When Britons are asked to name an evil person from history they almost always go for Adolf Hitler. This is probably why so few British children have been called ‘Adolf’ recently. To be honest, it comes as something as a shock to hear that even 25 babies have been so named since 1945, as one has to assume at least a few were in honour of Germany’s most notorious leader. There’s no doubt that ‘The Führer’ was an astonishingly nasty man and no one can seriously object to Hitler as Rolling Stone’s choice as ‘The Most Hated Man in Modern History’ in 2009. However, Hitler is far from being the only contender for that dubious crown, and there are others who have committed the most horrific crimes but who seem to have somehow slipped under the radar. In the Twentieth Century alone there were many people who would have recognised Hitler as a kindred spirit. They might not have agreed with him politically, but in terms of tactics, the likes of Mao Zedong in China, Pol Pot in Cambodia, Saddam Hussein in Iraq and Idi Amin Dada in Uganda would have understood where he was coming from. Of all the challengers, though, maybe one stands out as the real contender for the title of ‘Most Evil Man of the Century’: Joseph Djughashvili, the Georgian peasant better known to the world by his nickname, ‘Stalin’, which means ‘Man of Steel’. One has to be impressed by ‘Time Magazine’ here. Not happy with honouring Hitler as their ‘Man of the Year’ for 1938, they followed this up by giving the award to Stalin in 1939 and 1942. Strange times, indeed. Joseph Stalin led the Soviet Union or USSR (the Union of Soviet Socialist Republics) from 1928 until his death in 1953. Despite the fact that even the prisoners cried when he died, the fact that Stalin was Saddam Hussein’s hero should be enough to warn us that here was a man of some darkness. When Saddam visited Moscow as the leader of Iraq, he was only interested in seeing Stalin’s rooms. When he was growing up, he apparently modelled himself on Stalin: he grew a similar moustache, smoked the same cigarettes and he imitated his behaviour when he came to power, including ethnic cleansing and the ‘removal’ of enemies. And both Saddam and Stalin had something in common as they were, for significant periods of time, close allies of the West receiving some serious assistance from the USA and Britain. This has almost certainly been a key factor in explaining why Stalin has never been seen as quite as bad as Hitler. Let’s have a look at why Saddam and some others have loved this man while most Westerners have managed no more than fear tinged with a little respect and a lot of gratitude. Joseph Djughashvili (1879-1953) was born in Georgia, a part of the Russian Empire at the time and also one of the states which later formed the USSR. He was from a peasant background but showed himself to be reasonably clever in his village. He was chosen to receive an education which most children would have been denied at that time under the Tsar’s autocratic or dictatorial system. He went to the local junior seminary for trainee priests in the Russian Orthodox Church which was the only place to get any real education at that time. While he was there, Stalin discovered radical ideas and first came into contact with the ideas of Communism and he left the seminary to become a full time revolutionary taking on the name ‘Stalin’ for reasons of security and because it sounded strong. He joined the fledgling Communist Party and was imprisoned by the Tsar’s forces on many occasions. Like thousands of other revolutionaries living in that very conservative society, Stalin was sent to prison in the Urals and Siberia, escaping five times and making his way back to the west of Russia. He never really showed that he had any original ideas or exhibited behaviour that suggested he would become one of the most famous people of the century. Stalin’s journey to power started slowly and progressed slowly. He first met Lenin at the ‘Workers’ Hall’ in Tampere, Finland, in 1905 and went on to attend various Communist Party conferences in the years before the Russian Revolution (1917). He was not part of Lenin’s circle of friends and advisers, partly because Lenin was so much more educated and sophisticated than Stalin, the rough peasant. He played no real role in the two Revolutions of 1917 that came to establish Communism in the country, arriving to join in the chaos of that year. It was following the arrival of Lenin in Russia between the two revolutions, and especially in the aftermath of the ‘October Revolution’, that Stalin was to find his key role. Not only was Stalin diligent, organised and hard-working, he was also blessed with an almost photographic memory and total loyalty to Lenin and the Communist Party. While Lenin thought and planned, others argued over theory and strategy, looking inward and upward within the Party structures. Meanwhile, Stalin was left to do the dull, tedious work as General Secretary of the Communist Party, the lowest role on the Politburo, the main council of seven members, but a role which would, in time, create the power base from which he would control Party and the country, so changing the course of history. Stalin’s work involved allocating party membership cards, writing letters, arranging agendas and distributing minutes. He was the ‘dull’ man who was almost laughed at by the ‘intellectuals’ in the party, keeping his place simply because Lenin found him useful. How people can be underestimated. Stalin’s role as General Secretary of the Party was crucial for various reasons, most of all for the role he had as the one who distributed the membership cards of the Communist Party. He became the known name for party members around the country, the first point of contact in Moscow. These cards were issued each year so people came to rely on approval from Comrade Stalin to stay in the ‘good books’. He might not have any ideological ideas but Stalin had power on a practical level; the membership card meant access to meetings and access to certain privileges. Over the years, Stalin was able to promote or reject people as he saw fit. He could decide who came to Moscow to present the views of the party from each region. He knew the outsiders, those far from Moscow and Petrograd/Leningrad. He knew the secrets, like a Chief Whip in UK politics. While his colleagues on the Politburo argued on ideology and debated over policy, Stalin just listened and watched and remembered; Lenin controlled everything anyway so debate was futile but it might not always be the case. And what the likes of Trotsky, the apparent heir to Lenin and the strongest members of the politburo, never realised was that Stalin really was a force to be reckoned with, a man with a plan if the opportunity ever came his way. Things changed dramatically in Russia after the ‘October Revolution’. Lenin was the pre-eminent leader of Communism and everyone deferred to him but neither he nor the Party was able to establish Communism overnight. Chaos reigned in that huge country which had been struggling to modernise for several decades before under the rule of the Tsars. Russia was far behind the Western Powers economically and this was impacting on their fighting of the Great War where they had struggled in combating the vastly superior German Army for three years on the ‘Eastern Front’. 1.8 million men had died and there was no prospect of victory. With the Communist belief that the war was based on capitalist and nationalistic fervour, Lenin believed the war had to end. It was wrong that Imperialists were sacrificing the people for their own ends. The war ended promptly for Russia when the Treaty of Brest-Litovsk was signed in February 1918, with Leon Trotsky negotiating on behalf of Russia. Land was lost to Germany and reparations had to be paid but many celebrated the end of what had been a horrible war for Russians everywhere but especially on the front line. Trotsky was the obvious leader in waiting, if one was needed, in the years after the Revolution. He strengthened his position by creating and leading the Red Army to victory over the Whites (the Mensheviks and other opponents of the Bolsheviks) in the Russian Civil War (1918-21). This was a war which saw the Western Powers send soldiers and resources to try to defeat the Communists, something Stalin never forgot. But Lenin was relatively young, just 47 at the time of the Revolution, so there was no real need to consider what would happen in the coming years and who should succeed him. But in 1918, there was an assassination attempt on Lenin, who was badly wounded with one bullet remaining lodged in his head. Miraculously, he survived but he was never as strong again and after 1922 began to suffer a series of serious strokes. He was left unable to speak for the last year of his life before finally dying in January 1924. Lenin was just 53. There had been no heir designated by Lenin and Trotsky was a man with too many enemies to be able to assume power. Rather than an individual, it was decided that the Politburo was to rule instead. However, there were serious tensions within the group, things which had remained in check while Lenin dominated everything but were now able to come to the surface. There were tensions between the right and left wings of the party over the nature and the pace of revolution; there was distrust of Trotsky, the former Menshevik turned Bolshevik; there was concern about how far Lenin’s reforms should be carried forward, especially those that had involved compromise with capitalism, such as the ‘New Economic Policy’. Lenin allowed the so called ‘Nepmen’ to operate in the USSR as a way of keeping the economy going in the troubled years of the Civil War. They were allowed to operate businesses, set wages and even make some profit which would later cause major ideological divisions to arise within the Politburo. But there was another aspect to Lenin’s legacy which had to be handled in a rather more urgent and practical way. In his final years, Lenin had kept a record of many of his thoughts about his colleagues, including Stalin. This book of his writings and thoughts was known as ‘Lenin’s Testament’. At his death, this had been left with his wife, Nadya Krupskaya (1869-1939), but a copy had found its way to Stalin thanks to his control of people around Lenin, who included one of his secretaries. The document was to be addressed at a meeting of the General Council of the Communist Party but before this it was to be considered by the Politburo itself. It turned out that, in one way or another, ‘Lenin’s Testament’ attacked most of the Politburo, including Trotsky, Bukharin, Zinoviev, Kamenev and Pyatokov. However, Lenin’s strongest and clearest attacks were reserved for the General Secretary, Stalin, heavily criticising him for great rudeness towards Krupskaya. Lenin made it clear that Stalin had such a dark side that he should never be allowed to wield power within the Communist Party. Stalin should have been kicked out there and then but the threat of attacks on the reputations of the rest of the group saved him; Stalin had an extraordinary piece of luck as they took the decision that ‘Lenin’s Testament’ was not to be published and was not even considered by the General Council. Stalin survived and how the others would come to regret it. The Politburo ruled the USSR for several years until Stalin became leader in 1928. This simple statement needs some explanation as it has already been said how marginal a figure Stalin was in the leadership. Stalin had got lucky in 1924 and in the following years he benefited from being under-estimated by the rest of the Politburo. The other six men persisted in seeing Stalin as dull and irrelevant, a man who had no originality, no ideas, nothing to offer intellectually. He voted one way or the other without seeming to understand the issues or the details. Stalin was the pen-pusher, the stamp –licker, the meetings-man, the minute-taker; he was dull. But behind the scenes things had happened that were sifting the balance of power in the USSR. Out of sight of the Politburo which had turned inward to debate and argue with each other about the vision and the policies, Stalin was building a support base where it mattered; he was shaping the Party itself for his own ends. Stalin was still the name that the ordinary people knew and needed in Moscow. He sent (or did not send) the membership cards, he confirmed appointments, he directed people to attend one council (‘soviet’) or another. Stalin had the power to make a practical difference and over the years he manipulated people into positions where they could be made to support him and his plans. By 1926-7, he was growing in confidence to the point where he felt able to act. As he began his move for power, Stalin first focused on isolating his arch enemy Leon Trotsky and the left-wingers by siding with the right-wing over issues linked with the pace and nature of economic change and the future path of the revolution. In this debate, ‘World Revolution’, the radical idea favoured by Trotsky, lost out to the more conservative idea of ‘Communism in One State’, which was favoured by the right wing of the Politburo. Stalin had no real views of his own on this but he sided with Bukharin, the most popular figure on the Politburo, and the rest of the right-wing to defeat and oust Trotsky and the Left-wing members. Trotsky was isolated and was ultimately forced to leave the Politburo and, eventually, went into exile. Having apparently shown he was a supporter of the right, Stalin was then trusted by them but this proved to be a mistake as Stalin was nothing of the sort. His actions had been for his own benefit and soon he turned his attentions to achieving total power by removing Bukharin and the right wing, positioning himself more to the left with the support of the new members he had helped promote to power. Stalin had influenced promotions to all the ‘soviets’ below the Politburo and so he was able to bring in his own people even at that level. Stalin ousted the right-wingers in 1928 and was established as the leading figure in the USSR. In those early years, Stalin was far from secure in power but he would survive, transforming the Soviet Union during the 25 years of dictatorial power which he enjoyed until his death from a stroke in March 1953. There is a huge amount written about Stalin and it’s all fascinating stuff, so here there will only be mention of a few events that touch on his extraordinary life. Any research undertaken on Stalin is always fascinating and disturbing so be warned. In 1928, Joseph Stalin became leader of the Union of Soviet Socialist Republics. The country had been formally established in December 1922, covering a similar area to the former Russian Empire which had been one of the ‘Great Powers’ but one which had been isolated for centuries under the rule of the Tsars. It was a huge country by area covering about 1/10th of the world’s land mass and stretching across 5000 miles from the Polish border to the Pacific Ocean. The USSR had a relatively large population of about 130 million people but it was a backward, peasant economy. Karl Marx’s prophesy had been that that Communism would first arise in an advanced industrial society and this was not the way to describe the USSR in 1917. When Stalin came to power, he said the USSR was a hundred years behind the West industrially and had to make good that difference within 10-15 years or it would be destroyed. Stalin’s strategy for addressing this was the first of the ‘Five-Year Plans’ which was launched in 1928. Industry and farming were to be overhauled rapidly with a particular focus on heavy industries, such as mining and steel production. This in turn would develop transport, power and military strength, a key concern in the light of Russia’s history. The revolution in agriculture was to come through ‘Collectivisation’ which would create massive industrial farms and so replace the millions of small, inefficient, peasant-run, subsistence farms of Russia’s past. Things had to change at an astonishing speed and on a massive scale across the USSR. The outcome of that first ‘Five-Year Plan’ was the beginning of the transformation of the Soviet economy and society. It would see the start of industrial cities like Magnitogorsk, the massive growth of the industrial workforce and the arrival of the tractor in the countryside. The USSR would join Germany as the only economic success stories of the decade of the ‘Depression’ which followed the Wall Street Crash but the costs would be enormous. A whole tradition of farming would be wiped out in those years, as nearly all farmland came under the ‘collectives’ but it would devastate many areas and see the near wiping out of the most successful and talented peasant farmers, the Kulaks, and the horrid effect of the Ukrainian Famine of 1932-33. How did such a huge famine devastate the Ukraine, such a rich and fertile region, which was the leading grain producing area of the USSR? Stalin had decided to use grain as a way of trading with the West so as to acquire key technology and resources for industrialisation. As grain production fell in 1932, Stalin actually increased the demand for grain to be exported, blatantly putting the people at risk but maintaining industrial development in the process. Stalin watched on as between six and seven million Ukrainians died in the name of ‘progress’. And he added in a few extra deaths by attacking local politicians and the intelligentsia so as to crush nationalist ambitions. How many people in the West ever hear of the ‘Ukrainian Famine’? Think on the number of deaths – up to seven million people in little more than a year. That is a frightening statistic and one which is appallingly reminiscent of the number of Jews killed in the Holocaust yet little is made of it in the West. But maybe it was just ‘too far away’ for people to know or care? To drive industrialisation forward, the Five-Year Plans were based on a system of quotas and targets, something which traditionally brings corruption and manipulation in its wake. Each factory would receive its quota and each manager would be held responsible for the results. Corruption was rife as each manager aimed to meet or exceed the targets. Train drivers would be bribed to deliver goods to a particular factory, quality control was ignored in the race for quantity (the first tractors had to be pulled off the production lines as they did not work) and numbers were simply falsified. This led to an enormous number of deaths and imprisonments, as people who failed, questioned the system or challenged the results were ‘removed’. Thousands suffered by being accused of sabotage as managers and workers looked for people to blame for problems with machinery or the quality of goods. The quota system created a monstrous conspiracy of lies and deceit at every level as people tried not just to progress but to stay alive. It was far easier to blame a worker for breaking a machine than having to say that the machines were rubbish or that the system was flawed. A culture of fear and anxiety dominated Soviet society throughout the era of the Five-Year Plans, especially in the period before the ‘Great Patriotic War’ as the Soviets knew WWII. The problems around quotas and targets became even worse in 1935 when Alexei Stakhanov, a miner, set an extraordinary record for digging coal. It was achieved thanks to a whole range of aid given to him, but Stakhanov’s achievement in mining 227 tonnes of coal in one shift, some 30 times over his target, made him a national hero and created a new movement. The ‘Stakhanovites’ were the heroes of the Soviet Union, warriors who helped build a great future through their energy and skill. Everyone was now capable of going beyond the targets if they really wanted to. The fact that it was all largely the result of cheating and manipulation did not matter and the propaganda element proved to be powerful in encouraging even more ‘target breaking’. It also meant even more silence from those who did not believe in the process and a strengthening of the cult of Stalin as the great leader. Who was going to challenge the achievements of the great Stakhanov even if they knew he had been given the best equipment, unlimited power and a team of men to collect his coal? People wanted to live and soon every manager was trying to create a new ‘Stakhanov’ in his factory. But there was serious tension and fear in the Kremlin and in Stalin’s mind in the early years of industrialisation. Stalin was not secure in his position as leader of the USSR. In 1934, at the 17th Party Congress, the so-called ‘Congress of Victors’, a leading Communist from Leningrad, Sergei Kirov, received high levels of support and emerged as a rival to Stalin. Kirov received only three negative votes regarding his membership of the Politburo while Stalin received 267, more than anyone else. This was all covered up by Stalin who arranged for the removal of his negative votes but Kirov, a handsome and popular man, was clearly a potential rival. On 1st December, 1934, Kirov was assassinated at the Communist Party offices in Leningrad. Stalin’s involvement was always suspected but not directly proven. One thing which is clear is that the 17th Congress marked a change in Stalin. Nearly all those who attended the Congress would be killed or imprisoned during the ‘Great Purges’ of 1936-38, the systematic attempt by Stalin to kill all potential enemies and rivals, create a climate of fear and loyalty and to ensure his place of absolute power. The purges saw a wholesale attack on the Communist Party itself. In total, nearly a million people would be killed, imprisoned or ‘removed’, meaning over a third of the total membership of the Party was wiped out. Most famously, Stalin’s paranoia led to the ‘Show Trials’ and executions of some of the most high-profile members of the Party, including old colleagues and famous names of the revolution. Bukharin, Rykov, Kamenev and Zinoviev, old Bolsheviks who had played leading roles in 1917, would be among those forced in to humiliating admissions of betrayal while on trial, before being executed as enemies of Mother Russia. But the attacks focused on others, too, including the Army, the Navy, the Air Force, the Church, ethnic minorities and ordinary people. It was truly a reign of terror, a time which saw the deaths and imprisonment of millions of people. The numbers involved were even more frightening than those who suffered under Hitler and the Nazis at the same time in Germany. These dreadful events were just part of the dark-side of Joseph Stalin’s actions. The plus side was to be that he became ‘Uncle Joe’, Churchill’s name for him in his role as one of the ‘Big Three’. Stalin was one of the three Allied leaders of World War II, with President Franklin Roosevelt of the USA and Britain’s Prime Minister, Winston Churchill. Stalin played a pivotal role by leading the USSR to victory in what is known as ‘The Great Patriotic War, 1941-45’. His ruthless policies of industrialisation proved to be essential for victory in the war and the people of the USSR made huge sacrifices in achieving the defeat of Nazism. In all, an estimated 27 million people from the Soviet Union died in winning the war. When measured against the total deaths in the war, an estimated 58-70 million, the significance is clear; at least a third of all deaths in the conflict were suffered by the USSR. When compared with estimates for deaths suffered by the other Allies, the numbers become even more important: Britain – 450 000 deaths, France – 560 000 and the USA – 410 000. World War II was effectively won in the USSR and not in Western Europe. The saying is that the war was won with ‘American money and Russian blood’, and there is a lot of truth in it. But the figures hide some of the story as many of the Soviet deaths were really down to Stalin himself. There was a policy of brutality towards his own soldiers so that many were sacrificed in the cause of victory. Soldiers were sent in to battle without weapons, being told to pick up the guns of fallen comrades to carry on fighting; retreat was not allowed, the punishment being that soldiers were to be shot; soldiers were sent into battle simply to die, the theory being that the German Army would run out of ammunition in killing more and more people; there was little effort made in saving lives on the battlefield or to giving medical treatment to the wounded as this cost money and time. The horrible truth is, though, that against huge odds, especially at the three great battles for Moscow, Leningrad (now St. Petersburg) and Stalingrad (now Volgograd), the USSR emerged victorious and turned the tide against the Nazis in the east. There were many vital moments in World War II, such as the Battle of Britain, Pearl Harbor and D-Day, but the events which probably have the greatest claim to being ‘the’ turning point were those Russian victories that defended the cities of Leningrad, Moscow and Stalingrad. And those millions of Soviet deaths undoubtedly saved the lives of uncountable numbers of people in the West. Every allied country benefited from Stalin’s approach. There are many other things that could be written about Stalin: the infamous Nazi-Soviet Pact, the cult of personality, the role of the secret police and others being just a few. ‘Uncle Joe’ was a paranoid psychopath really and hardly the type of man to be stuck in a lift with. He was probably responsible for the deaths of well over 30 million people (estimates range from 10 million to 60 million) and that really is a lot of people for a man who is somewhat ignored by some people today. But, in many ways, Stalin’s policies were effective and can even be considered successful, despite the horrendous costs, because the USSR did industrialise in the 1930s so that it could just survive the Nazi attack of 1941 and so play the pivotal role in the Allied victory. This is one of the most horrid truths in modern history, namely, that Nazism was defeated because of Stalin; millions of people in the West are alive today because of Stalin; millions of people in the former USSR are not alive today because of Stalin. And yet he is a peripheral figure for many Westerners while being adored by many people in Russia so that there have been several attempts to re-instate him as a true hero of Russian history. There is much more to be said about Joseph Stalin than can be covered here. The shock and out-pouring of grief at the announcement of his death on 5th March, 1953, was quite extraordinary. People across the USSR were stunned into disbelief as their great leader of the last quarter century was gone. Tears flowed across the nation, even in the gulags where so many thousands had been unjustly imprisoned by Stalin himself. The politburo was thrown into confusion and a power struggle ensued from which Nikita Khrushchev would eventually emerge as leader. The USSR was, of course, profoundly changed by Stalin’s death and so was the world, a world in which the nation transformed under Stalin was a Superpower, the leader of the Communist world. Relations with the USA and China, for example, developed a whole new dynamic following the death of Stalin – and it was not always a safer place or a calmer relationship. Joseph Stalin was, above all, a winner and a survivor, the man who turned the USSR from a backward peasant state in 1928 to a Superpower with the atomic bomb in 1949. But being a winner does not always make you good so please remember Iosif Vissarionovich Djughashvili, Joseph Stalin, the ‘Man of Steel’, when people go on about the worst man in history; Hitler does have competition. Books: ‘Stalin: The Court of the Red Tsar’ (2007) and ‘The Young Stalin’ (2008), both by Simon Sebag Montefiore. Both are easy and exciting reads that serve as excellent introductions to Stalin. Books: ‘The Whisperers: Private Life in Stalin’s Russia’ by Orlando Figes. Books: ‘Stalin’ by Robert Service. Generally seen as the definitive biography of the evil genius. Books: ‘A day in the life of Ivan Denisovich’ by Alexander Solzhenitsyn. The famous book telling the story of life in the gulags through the life of one inmate. Books: ‘The Forsaken’ by Tim Tzouliadis. A little known study of the Americans who emigrated to the USSR and suffered in the 1930s and 1940s. Books: ‘Gulag’ by Anne Applebaum. A fascinating and powerful study of the whole system of the gulags. TV: ‘The Cold War’ (CNN) The outstanding documentary by Jeremy Isaacs has numerous episodes that tell the story of Stalin and the Cold War. ‘The Great War’, ‘World War I’, ‘The First World War’, ‘The War To End All Wars’. 1914 to 1918, or 1914 to 1917, or 1917 to 1918, depending on which country you were in. Whatever you want to call it and whatever you might think of it, the ‘Great War’, was very, very big and very, very important. It was a quite extraordinary event that marked a dramatic change in world history, shifted power between nations, redrew maps, changed international relations and killed more people than any previous war. There is good reason to see it as one of the most significant events of the Twentieth Century, alongside the Great Depression, World War II and the Cold War, and, in some mistaken minds, such ‘sensational’ moments as England winning the World Cup, the arrival of ‘Rock’n’Roll’ and the invention of colour TV. Here we will just take a brief look at the origins of the Great War, a tragic tale of boredom, revenge, envy, technology and bad luck. The Great War did not start for one simple reason, one of the facts of life in history which can upset some people. Nothing so big can ever have a single cause and the road to that war was along many routes and from many different places, factors which merged together in the glorious summer of 1914. Some of these causes were long term, a few were medium term, others were short term and they were ignited by one final trigger. It was like building a good bonfire: you need some big chunks of wood (like railway sleepers and old fashioned wardrobes) which are hard to set alight but when they do they will keep going for ages; these are the long-term factors. Next you need some medium-term issues, which are like good branches and chairs which will help set the sleepers and wardrobes on fire. After that, small twigs and kindling, maybe some rags and newspapers, which will fill in the gaps of your bonfire and catch light easily. Finally you need a light, a match which will get the whole thing going. This is the trigger, often just a tiny flame which can be transformed into a terrifying conflagration. So, what set the war off? As so often happens in history, it would be useful at this point to have a look at some maps, to help your understanding of the situation in the world of 1914. In Europe, you should look at the way the continent was dominated by five great powers: Britain, France, Germany, Austria-Hungary and Russia. Notice how few countries there are in total and the absence of many familiar modern-day countries and borders. When you consider the strength and status these European Powers enjoyed thanks to their worldwide Empires, especially those of Britain, France and Germany, you can quickly see how this became the first truly global conflict. You should also look for maps that show you how the Great Powers split into the two alliances after 1914: the Triple Entente of France, Britain and Russia (with Italy after 1915 and the USA from 1917), the ‘Central powers’ of Germany, the Austro-Hungarians and Italy (until 1915) with Turkey (from 1915). And in case you don’t have time to find these maps for yourself, here are a few to help. This map shows the war alliances as they were at the start of the war in 1914. As mentioned, Italy actually switched sides in 1915, believing it had a better chance of gaining land and status there than with the central Powers. The Ottoman Empire joined the Central powers, again in 1915. It’s important to note that the alliances of the Great War were not deep and long-standing relationships based on deep trust, lasting friendship and a long-shared vision. The treaty between Russia and France, for example, had only been signed in 1894 while the one between Britain and France was only agreed in 1904, just a decade before the war itself. The alliance between Germany and the Austro-Hungarian Empire had been signed in 1879, and extended to include Italy in 1882. If you study some maps of Europe in 1914, you should also notice that some of the countries were a very different size and shape from what they are today; Germany, for example, was much bigger than it is today and had a border with Russia. There were also ‘states’ or empires, like the Austro-Hungarian Empire, which do not exist today but was an ancient territory that covered much of central and south-east Europe: modern Austria, Hungary, parts of Germany, Romania and Poland, the Czech Republic, Slovakia, Slovenia, Croatia and Bosnia-Herzegovina. Other countries with which we are very familiar today, such as Poland, the Czech Republic and Slovakia, for example, did not exist and were parts of those former Empires. All of these states and regions, all of the many people, would be dramatically changed by the events of the next four years for this was war on a scale never seen before. After 1918, the whole map of Europe an, indeed, the world would be re-drawn. So, why did this ‘Great War’ come about? Not surprisingly, this is not a small question and there can be no short answer. There were, instead, several long-term and medium-term factors which combined to provide the main fuel for the fire which was the Great War. One of these was, surprisingly, boredom and restlessness among the major European armies. The great European powers had a long history of fighting each other and, compared with most earlier periods, the nineteenth century (the 1800s) had actually been rather peaceful with little by way of a ‘proper’ war since the defeat of Napoleon at the Battle of Waterloo (which is in Belgium by the way) in 1815. There had been the Crimean War, of course, which had seen the British and French humiliate the Russian Army in 1854-56 and also the very important ‘Franco-Prussian War’ (France v Germany) in 1870-71, but overall, things in Europe had been very quiet for the best part of a hundred years. During this period, most European conflicts had in fact taken place in the more remote parts of the world, as the main powers made moves to develop and control their Empires. ‘Real’ war between the big players just hadn’t happened. Most people would consider this situation of relative peace to have been a decidedly ‘good thing’. However, during the years of peace, one great development had been transforming the world, namely industrialisation. It had changed everything: work, pleasure, transport, buildings, diets and many other things. Those ‘other things’ included weapons. Massive scientific and technological advances had impacted on steel production, chemicals, fuel and machinery, so that military power had been transformed by the creation of powerful new weapons which had been made available to armies and generals across the continent. Armies had also got bigger as populations grew rapidly on the back of industrial progress. But many of those soldiers, especially the generals, had gone through their whole careers without the opportunity to use them. Many of them were restless, and eagerly looking for an opportunity to use their new ‘toys’. It may seem ridiculous to us but conflict between nations was seen as a far more natural and expected fact of life back then. Boredom really was an important factor in starting the Great War. Another factor which led up to the war was the shifting balance of power between Europe’s major players. England’s traditional enemies were, of course, France and Scotland. If anything, England (and later, Britain) has had a far greater bond with Germany than it ever had with France for most of history; the ‘entente’ or ‘understanding’ with the French was a recent development, based in part at least on King Edward VII’s love of all things French, especially wine, food and women. Meanwhile, Britain had started to face a growing threat from Germany, partly in economics (as the German industrial-based economy overtook Britain’s around 1900) but also militarily through its navy. The German-British ‘arms race’ was shifting the traditional ‘balance of power’ by which peace had been maintained in Europe. France also felt a deep sense of anxiety at the military threat posed by the industrial strength of Germany but her people also wanted revenge for their defeat to Prussia in 1871. This had been a massive blow to national pride and resulted in the loss of two French regions, Alsace and Lorraine, to German control. Although it may be hard to see him as a ‘Ladies’ Man’, Edward VII’s love of all things French played a major role in the alliance between the two countries which had such an impact on the Great War. He is pictured here with his wife, Queen Alexandra. Germany, by the way, had only been properly united as one country on 18th January, 1871, as a result of victory in the Franco-Prussian War, having previously been the ‘Holy Roman Empire’. This Empire had existed for a thousand years and had united many states, over 200 at times. These states had included large regions like Prussia, Bavaria, Bohemia and Saxony, with others which were very much smaller, like Lichtenstein, Thurn and Taxis, Luxembourg and Fürstenerg. The key man in the whole process of German unification, and the creator of what would be called the ‘Second Reich’, was ‘The Iron Chancellor’, Otto von Bismarck (1815-1898), a huge figure on the European and world stage. He deserves a picture. Another key factor that led to the Great War was the arrival on the scene of the hugely important Emperor, Wilhelm II (1859-1941) or ‘Kaiser Bill’ as he was known to British troops. Wilhelm became Emperor of Germany in 1888 following the death of his father, Frederick III, after only 99 days on the throne. Wilhelm would remain as ruler until 18th November, 1918, just after the end of the war, when he abdicated. Kaiser Wilhelm II played a major part in creating the tension that almost made the Great War an ‘inevitability’, a word to be used with great caution in history. Wilhelm demands a little more attention. Wilhelm II was a complex character. Of course, many of us can claim to be ‘complex, brilliant, misunderstood’ figures but rarely do we come to wield the power of a dictator as Wilhelm did, though. He had numerous dangerous characteristics, being described as vain, ambitious, jealous and greedy for power. Wilhelm was also impulsive, inconsistent, obsessive and a bad listener; one can see that such a man as a dictator was potentially hazardous for all concerned. One other thing which is of particular significance, and what often sees in photos and film of him, is that he had been born with a withered left arm. Less obvious is that he also had terrible issues with his balance due to a problem with the development of the inner ear. This was very damaging to his self-image and to his ability to ride a horse, an essential for any royalty of the day. In learning to ride as a child, Wilhelm was put on a horse, day after day, for several years before he could stay upright. The falls he suffered and the abuse shouted at him, fired a fierce determination, a self-loathing at his ‘weaknesses’, a desire for power and a certain pleasure in the pain of others. Such characteristics can make an individual’s life and relationships challenging; in a ruler, they can bring disaster for millions. Kaiser Wilhelm knew England well, being a grandson of Queen Victoria, the ‘Grandmother of Europe’, as she was known because so many of her children had married into other royal families around the continent. Wilhelm visited England often and was fascinated by the Royal Navy. It is fair to say that he actually had quite an obsession with Great Britain and looked across the North Sea with particular envy and a desire to emulate her success. From the Isle of Wight, where Victoria often received Wilhelm as a guest, he would see the great warships pass, and he nurtured the desire to create such a navy of his own. German ships were invited to join the procession to mark Victoria’s Diamond Jubilee in 1897, but were overshadowed by the British, much to Wilhelm’s shame. Wilhelm was actually given his own ship in the Royal Navy and was an honorary ‘Rear-Admiral’, giving him a uniform he loved to wear. Thanks to the rise of Germany’s industrial power, Wilhelm had the opportunity to address his naval and military needs. Thanks to Krupp’s steel, for example, he had the opportunity to build ‘a fleet of my own’, especially new battleships, and so to compete with Britain for control of at least some of the seas. The British Government watched with alarm as these mighty German ships were launched, and responded by building the largest battleships ever: the Dreadnoughts. Despite all this, Britain’s desire to stay out of European affairs was strong and the Empire was far more the focus of her attention. However, there were plenty of people who thought that if the Germans wanted a fight they could have one, and that the chance to ‘put them in their place’ was not to be missed. Tension was rising in the first decade of the century. It should be remembered that the prelude to war was not all to do with Germany. Another area of tension was the Austro-Hungarian Empire which had been in decline for many decades. After 1848, the country had faced growing internal pressures as it tried to keep control of people of many different nationalities, cultures and religions within its borders. However, the memory of glory was strong among many leaders and generals, so that the there was not just a willingness to fight but even a desire for it, a cleansing of defeats past and the rebirth of a dynamic new empire. The relative successes of the Balkans War (1912-13) suggested they were still a powerful force. Elsewhere, things were not so clear. Italian involvement was especially confused, although having signed the ‘Triple Alliance’ with Germany and the Austro-Hungarians in 1882 as a means of defending themselves against any threat from France and Russia, they did decide to honour their commitments when war started in 1914. However, there was much opposition to this from within Italy itself. The Ottoman Empire (basically modern Turkey, Syria, Lebanon, Israel/Palestine, Jordan, Iran, parts of Iraq and Saudi Arabia) would also become involved (after 1915) on the side of the Central Powers, partly as a way of withstanding any threat from Russia, its main enemy. The Ottoman Army was not strong, having fought badly in the Balkans War (1912-13) and this made an alliance essential. Fear was, therefore, a powerful reason for their involvement in the war. So, why did the Great War start in 1914? In the briefest of summaries, we have: boredom in the military, coupled with the desire to try out new weapons; France’s desire for revenge and its old territories back; the push for Germany, under Wilhelm, to increase its naval power and rival Britain militarily; and the Austro-Hungarian and Ottoman Empires and Italy’s fear of their stronger neighbours. War would bring risks but also opportunities for power, land and glory. It is important to realise that the values which dominate societies do change overtime and this was especially true about Europe in the early years of the Twentieth Century. One factor which marked those days more than our own times was a widespread sense of nationalism, something well beyond patriotism, something far more aggressive, which looked down on foreigners with deep hatred. A word widely used in Britain was ‘Jingoism’, a sense of one’s own superiority with a belief in the right to win and to take over what belonged to someone else. This ‘nationalism’ meant decisions were made and events were interpreted by people who saw things in very stark terms: anger, revenge, glory, victory, hatred, distrust; us and them; right and wrong; kill or be killed. Into the powder keg of fear, anger and greed came one horrid spark, a shot which would ring out around the world. The famous incident which finally set the European bonfire burning in the summer of 1914 has not been mentioned yet. The final element, the match or the trigger, was the death of a rather pompous and difficult man in a far off country, an event which might well have been a mere footnote in history had circumstances been a little different. This ‘spark’ was the assassination of Archduke Franz Ferdinand, the heir to the throne of the Austro-Hungarian Empire. Far from a footnote, his shooting was to become a headline on an epic scale. On 28th June, 1914, Franz Ferdinand and his wife, Sophie, travelled down by train to Sarajevo, the capital of Bosnia-Herzegovina, which had come under the control of the Austro-Hungarians in 1912-13 as a result of the ‘Balkan War’. They went to visit the soldiers of their Empire who were seeking to hold on to the region against local groups who were unhappy at their loss of independence. On their arrival at the railway station, the royal couple travelled down into Sarajevo by car but on the way they came under attack from a grenade thrown by a member of ‘The Black Hand Gang’, a group which wanted independence for Serbia, another region of the Balkans and also under the control of the Austro-Hungarians. They survived as Franz Ferdinand saw the bomb coming, put up his arm and deflected it away, unfortunately causing it to explode under the car behind. It injured about 20 people, including their attendants in the car. The visit continued with a reception and speeches at the City Hall but Franz Ferdinand and Sophie wanted to visit the injured in the hospital. The driver of the car who was to take them to the hospital got lost as he took a wrong turn, one of the simplest, most devastating errors of all time. While he was reversing in a narrow street, trying to get back to the route, a member of the ‘Black Hand Gang’, Gavrilo Princip, just happened to walk by having come out of a shop; it was a pure coincidence that he saw the car. He was carrying a gun and fired two shots, hitting both the Archduke and his wife. Sophie, who was pregnant, died in her husband’s arms before he too died in the car. He was 51 at the time, and she was 46. Those shots would echo across the world. Princip was not executed because he was under 20 years of age; he died of tuberculosis while in prison in 1918. But his actions were to live on as the shootings would set Europe on fire for four years. Actually, it is only right to use another photo from that day, an image which is one of the most famous in history. 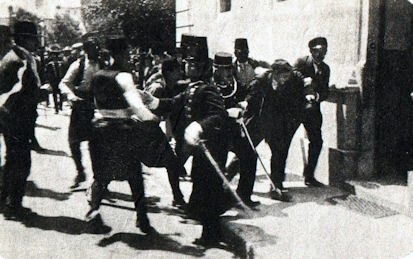 This is Gavrilo Princip being arrested and taken to the police station in Sarajevo. But why did this killing of an heir to a throne, in an obscure town in a distant country, lead to 16 million deaths in the Great War? The key lies with the alliances described above. The Austro-Hungarians were furious with the Serbians for what had happened and gave them a list of 30 demands that they required to be met within a month, as reparation for the loss of the Archduke. The Serbians felt able to accept all but two of these demands. But this was not enough for the government in Vienna and the Austro-Hungarian Empire declared war on Serbia, triggering a chain reaction of declarations of allegiance on both sides. The declaration of war set in train a series of alliances. Russia had an ancient agreement to defend Serbia and so declared war on the Austro-Hungarians. The Germans honoured their alliance with the Austro-Hungarians by declaring war on Russia, leading France to declare war on Germany. Germany was determined to avoid a direct attack on France owing to a line of huge forts which had been built on their joint border by the French since 1871, and so decided to invade with a sharp and dramatic attack through Belgium. This was called the ‘Schlieffen Plan’. But Britain had a treaty with Belgium going back to the 1830s saying it would protect Belgium if it were invaded. So it was that on Bank Holiday Monday, 4th August, 1914, Britain found itself at war with Germany as a way of defending ‘plucky little Belgium’. And the rest really is history. Books: There are obviously many books which deal with the Great War. A few novels and factual books which might be used to introduce the war include: ‘Birdsong’ by Sebastian Faulks; ‘All Quiet on the Western Front’ by Erich Maria Remarque; the ‘Regeneration Trilogy’ by Pat Barker; ‘Testament of Youth’ by Vera Brittain; ‘Forgotten Voices of the Great War’ by Max Arthur; ‘The Great War, 1914-1918’ by Peter Hart; ‘The Western Front’ by Richard Holmes, and ‘1914-1918’ (BBC). Films and dramatisations: ‘The Battle of the Somme’ (1916), ‘The Trench’, ‘Gallipoli’, ‘A very long engagement’, ‘All Quiet on the Western Front’, ‘Birdsong’. War Poets: ‘Poems of the Great War’ (Penguin): Wilfred Owen, Siegfried Sassoon, Rupert Brooke, John McCrae, Edward Thomas, Ivor Gurney and many others. Maps: Study maps of Europe from 1914 and from the 1920s to analyse the creation of new countries and the changes to old borders.